I've made three sets of these before and I just love them. 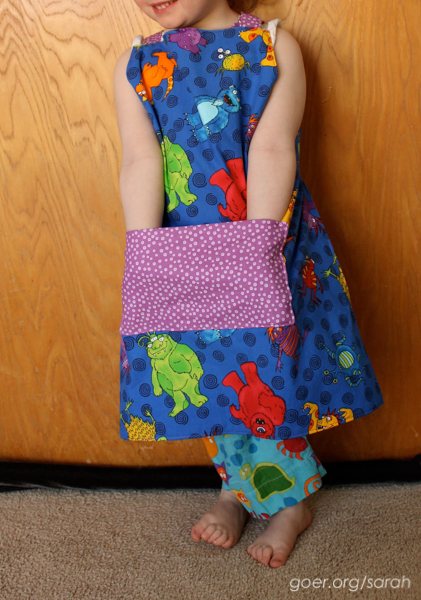 The pattern (links to patterns available on Making It Fun) is thorough and it's a well finished product. My son loves his Very Hungry Caterpillar set and my daughter is quite pleased to have her own. She was even willing to do a bit of wiggly modeling. 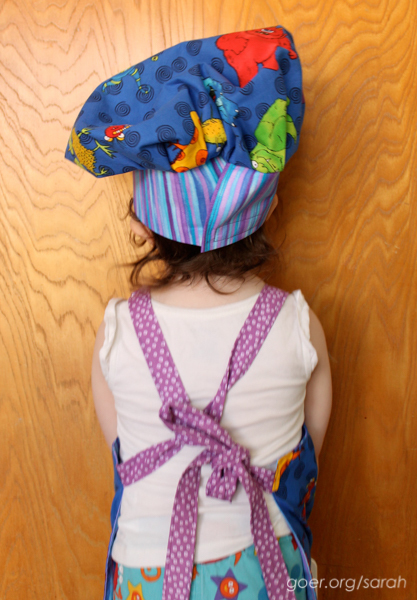 A little blurry, but I wanted to show how I tie the apron on the tiny child. The neck strap has an adjustable D ring, but if I cinched it up tight enough to keep the apron from nearly dragging on the floor it would be choking her. So, I put the waist straps through the neck loop before I tie them which keeps the apron up nicely. It will grow with her for many years. The hat has a velcro closure, so it will also fit for quite some time. Truth be told, it's a little big for her at the moment. 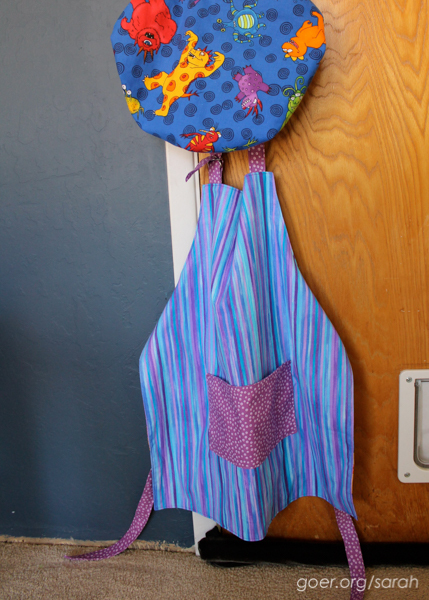 She was "over it" on the modeling so here's the other side of the reversible apron. I'm linking up to A Lovely Year of Finishes for completing my May goal and the Sew Darn Crafty link-up. Posted in Kid Stuff, Sewing. 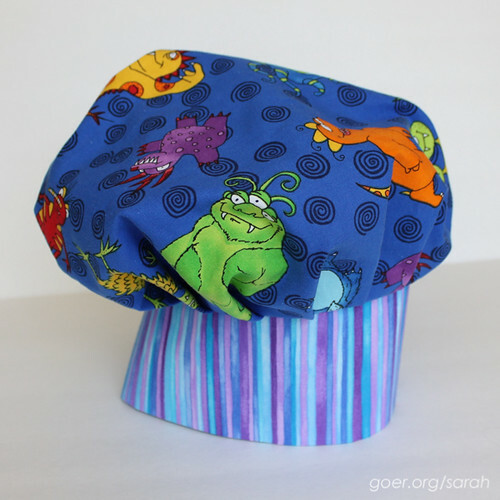 Tags: ALYoF, apron, chef's hat, sewing for kids on May 31, 2015 by sarah. Well crud. The last time I linked to it the link on Stardust Shoes still worked. :-P Let me poke around and see if I can find it anywhere else. Thanks for visiting! Be sure to show me when you make yours! i love the hat, very cheffy! 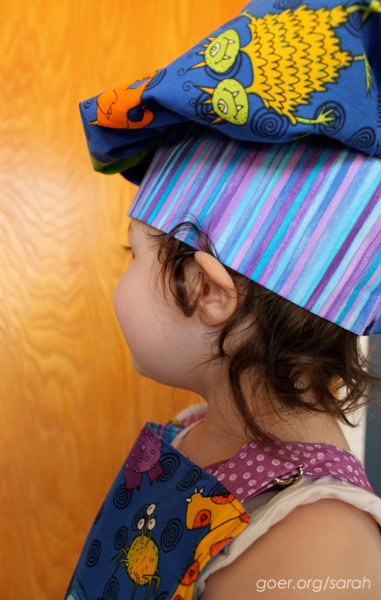 Very cute and I'm sure she loves the hat and apron.